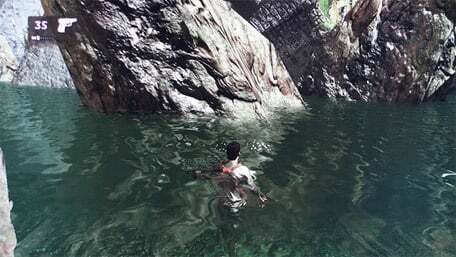 How Does The Water Look In Uncharted 2: Among Thieves? We're Hoping Drake's Clothes Literally Drip Dry This Time Around. Hell, they even set the first level in the middle of the ocean just so you knew from the offset that this game had amazing water. Well here's a sneak peak at how the water physics have advanced in Uncharted 2: Among Thieves. The screenshot - courtesy of Playstation Lifestyle - isn't the highest quality, but you can already see the glorious refracted lighting effects occuring on the pebbled water bed. Naturally seeing this game in motion is the biggest draw, especially with Naughty Dog's excellent motion capture techniques. Hopefully we'll see a full water level soon. Update: While totally unfamiliar with us, it's been confirmed that this screen actually comes from Uncharted: Drakes Fortune. Which just shows you how far ahead of its time that game was graphically. We were all fooled! And yes, the PushSquare team feel like tools!